Sunday, December 6, 11:30 – 12:30, (RE)training for Acolytes and Chalice Bearers: Some of us were trained forty years ago and could use a refresher course; some of us were never trained, but just told to “watch what she does and do the same;” some of us would like to better understand why we do what we do; some of us would be interested in learning a new ministry. All are invited / strongly encouraged to attend a training session after the 10:00 service on Sunday, December 6 in the chancel. If you really, really cannot make this date, please be in contact with Tim+ or Kathleen+ to schedule a make-up time. Advent Book Study: For the four Sundays of Advent, Tim and Kathleen invite you to a discussion of From Holidays to Holy Days: A Benedictine Walk through Advent by Albert Holz, OSB. The author, a Benedictine monk who lives in the center of downtown Newark, New Jersey, invites the reader to join him on his daily walks as he points out dozens of often-unnoticed connections between our holidays and the spiritual meaning of Advent and Christmas. Rather than criticizing trappings of the holiday season, this book looks at them from the viewpoint of Christian contemplation, once aptly described as “a long, loving look at the real.” The book is available from Amazon, or through the Parish Office for $16.00. Please place your order with the office by Monday, November 23, to get the book by the first Sunday in Advent. Advent Wreath-making: Sunday, November 29, at 5:00 p.m. Bring a sandwich (or whatever) to share. Soup and cider provided. Please bring your wreath form/candles and some “tipped” pine, cedar or other material to weave into your form. This is a fun way to start Advent and keep it visible each day. Potluck Supper with music by The Kelly Farm Five, on Monday, December 7, 6:00 p.m. Bring a dish to share and toes to tap! Drinks and dessert provided. RSVP to 244-4582. Christmas Fair: Saturday, December 5, luncheon 9-1 pm, raffles, white elephant table, crafts, and baked foods. Angel Tree: The Parish will be pairing with local organizations and our local elementary school to identify those in need. Our goal is to alleviate some of the stress of the Christmas season by continuing to support their needs through our Angel Tree program. For those of you who aren’t familiar with our program, we reach out to our parishioners each year asking for donations. With these donations we purchase clothing, outerwear, sneakers and boots for children of the identified families. We also have a tree in the back of our church with tags representing other types of gifts the children are hoping to find under their Christmas tree. Individuals can pick up these tags in the weeks prior to Christmas so they can buy the gifts listed on the tag for an individual child. Once purchased, you would return the gift to the church and leave them under the tree where they will be picked up, wrapped and delivered to the individual families. We are happy for people to participate in whichever way they wish. The Annual Thanksgiving Food Basket Project will once again be organized by the Bar Harbor Congregational Church. As many of you know, these baskets are distributed through the two local food pantries--Bar Harbor and Westside. The church fills and assembles the baskets, local Bar Harbor schools and church schools often decorate the baskets and collect food items--it's an important learning experience for the children in giving and receiving. Once again the Westside Pantry will take orders, distribute the baskets from the Southwest Fire Station, and supply meat vouchers. Needed are several larger vehicles--SUV's, vans, wagons, pick-ups--and people to carry the baskets from the church to the vehicles in Bar Harbor and from the vehicles into the Fire Station in Southwest. Please indicate your willingness to lend hands or drive a vehicle. Let me know what kind of vehicle you are offering. Let me know if you can help with the distribution on Tuesday. Thanks in advance for your help to make this project a reality. 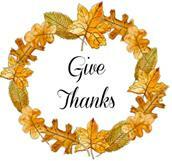 Community Thanksgiving Service, Tuesday, November 24, 5:30 PM, St. Saviour, Bar Harbor. This service is collaboration among clergy from several different congregations, and is intended as an opportunity for the whole community to gather across the lines of denominations and traditions to remember the many blessings in our lives in an ecumenical service of scripture, prayer, hymns, and thanksgiving. Note that this will be the Thanksgiving worship service for St. Andrew & St. John and St. Saviour; there will not be a separate service on Thursday. Keep in your prayers this week: Gloria Magruder, Catherine English McCann, Patrick Foote, Heather Frazer, Jamie Li, Malcolm Hughes, Adam Harkins, Nancy Kincaid, Trevor Agar, Herb Hasenbalg, Jack Weisner, John Cronin, Sarah Flynn, Trisha Roy, Bob Theriault, Ron Martin, Joseph and Kimberly Pratt family, Lydia Thayer, George Swanson, Jennie Cline and Sharon Dayana Salazar, our sponsored child in Costa Rica. Christmas Fair, Saturday, November 21, 9 am-2 pm; Silent auction with great gift certificates (including Galyn’s and Salt Box! ), fine crafts by local artists, kids shopping, handmade gifts, pies (just in time for Thanksgiving! ), baked goodies, jams, jellies, and added this year, a chowder, grilled cheese and other delicious goodies luncheon. All proceeds will benefit THAW and school backpack programs. Thanksgiving is a time when we remember the many blessings in our lives, and a group of MDI pastors are sponsoring an ecumenical service of scripture, prayer, hymns, and thanksgiving on Tuesday, November 24 at 5:30 PM at St. Saviour’s Church in Bar Harbor. The service is collaboration among clergy from several different congregations, and is intended as an opportunity for the whole community to gather across the lines of individual denominations and traditions. The Maine Seacoast Mission is sponsoring the service, along with the MDI Clergy Association. Singing will be accompanied by St. Saviour’s Interim Music Director Andrea Horner at the organ and piano. The Rev. Rob Benson of Bar Harbor Congregational Church will be the preacher; other participants are the Rev. Sue Cole of The Church of Our Father in Hull’s Cove, the Rev. Jane Cornman of the Episcopal Parish of St. Mary & Jude, Northeast Harbor, the Rev. Tim Fleck and the Rev. Kathleen Killian of St. Saviour’s Episcopal Church Bar Harbor and the Episcopal Parish of St. Andrew & John, Southwest Harbor, and the Rev. Victor Stanley of Somesville Union Meeting House UCC. The MDI Clergy Association has developed over the past three years from an informal gathering of island pastors invited to meet for lunch regularly by Rev. Planting. The group discusses and coordinates response to island-wide issues as well as supporting one another in ministry. For the last several years the group has coordinated the ecumenical Martin Luther King Day celebration at the Mission, as well as last year’s Thanksgiving service at St. Saviour’s. Sunday, November 29, 4:00 PM, Somesville Union Meeting House: Bridge over Troubled Waters. The holidays can be a difficult, lonely time, especially for those who are grieving. Join members of other MDI churches for a worship service to acknowledge the pain that can come this time of year. The Kelley Farm Five: A new band will be playing from 7-9 at the re-opening of Sips in Southwest Harbor on November 18. The Kelley Farm Five band members are Rick Barter, Amy Kurman, Beth Herrick, Jim Vekasi, and Fred Benson. Their music spans a range of genres, from traditional folk music, to early 20th-century jazz/popular songs, to contemporary, pop/country and even a few original songs. The group plays soprano, concert, tenor, banjo and bass ukuleles, and a mandolin. They provide a pleasing, mellow sound with very creative vocal harmonies and instrumentation. Reservations required - please call 244-4550. Keep in your prayers this week: Gloria Magruder, Catherine English McCann, Patrick Foote, Heather Frazier, Jamie Li, Malcolm Hughes, Adam Harkins, Nancy Kincaid, Trevor Agar, Herb Hasenbalg, Jack Weisner, John Cronin, Sarah Flynn, Trisha Roy, Bob Theriault, Ron Martin, Joseph and Kimberly Pratt family, Lydia Thayer, George Swanson, Jennie Cline and Sharon Dayana Salazar, our sponsored child in Costa Rica. Veteran's Day Service - Wednesday, November 11 at 11:00 AM at Bar Harbor Congregational Church, 29 Mount Desert St. Bar Harbor. COFFEE’S ON! The Maine Sea Coast Mission cordially invites all MDI Senior Citizens to join them for Coffee, Conversation and Music every first and third Tuesday of the months during the winter. The next get together is Tuesday, November 17 from 9:30 to 11:30 am at the Colket Center, 127 West Street, Bar Harbor. Music will be provided by Ruth Grierson! Come, brings senior friends and neighbors and join the fun!